Nimble is a game that will present you with neither interesting nor agonising choices. It will not test your resolve, or your ability to read a bluff in a friend's face. It will—as the name may hint at—test your reactions, your nimbleness if you will. 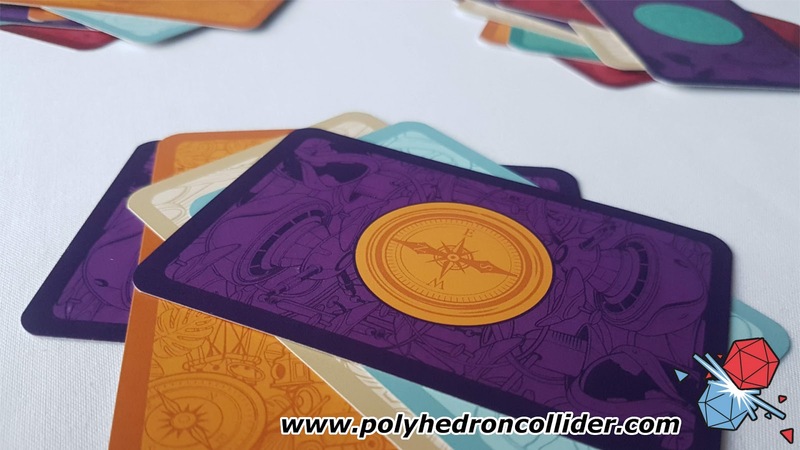 The rules and gameplay are very simple; all you have to do is draw a card from the top of your player deck, briefly place it on your discard pile and then place it on one of the central piles, where you will match the frame of your card to the circle of one of the central cards. The first person to burn through their deck wins, if they haven’t made any mistakes that is. That’s it. That’s the entire game mechanics. 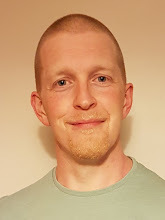 You may think it sounds a lot like snap, and you’re halfway right, it does have that feel of snap but the good part of snap, all the excitement without the boring waiting. In Nimble, the game progresses as fast as the players, once someone says “Go” you do just that. If you can’t find a match you put the card in your discard and draw again. Another player beats you to the central deck, forcing a change and you have to start your frantic search all over again. The game is about quick decisions, quick reactions and even quicker recognition. I find myself holding my breath playing, focusing all my attention on the cards, forcing my eyes to only look at one part of the card in my hand and one part of the card on the central piles, it’s here that the game tricks you. So why can’t you get it right, why that moment of hesitation, that moment of second-guessing. You know what a frame is, you know its cream. And you know what a circle is, just look for a cream circle on one of the piles in front of you. Why is that so hard? It’s not as if the circle is hidden somewhere, but it does feel like it, that one cream coloured circle in a sea of pastel colours – some of which will be cream. Playing this there will be mutterings of “redredredredredredredredred” and “purplepurplepurplepurplepurple” like your extras in a TV show and you’ll do it just to keep focused. I say it feels like the exciting parts of snap because there is a simple pure delight in finding your match quickly. That thrill of getting three cards on the bounce down, down and down all to the dismay of your opponents that stop their colour-chanting-mantra to groan. 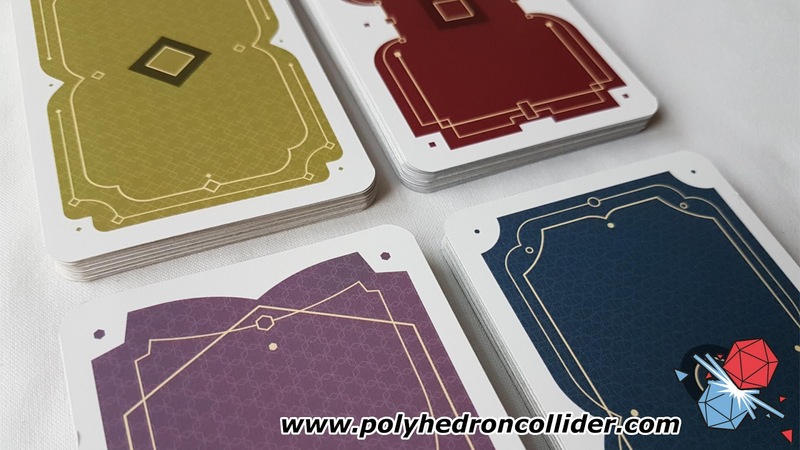 Stringing the cards together, the errors are easy to spot and the erroneous card is easily matched to its player by means of its colour coded back. And that’s why there is the second-guessing, why there is that hesitation during the frantic gameplay; one wrong move now will cost the entire game. How long do you risk checking? Do you trust your eyes enough, are you saying the colour of the frame right now or the circle of the card in your hand. You’d better check again. With a game that is so dependent on colour, there is the rather obvious consideration of accessibility in regards to forms of colour blindness but the publishers here have you covered in a charming way. 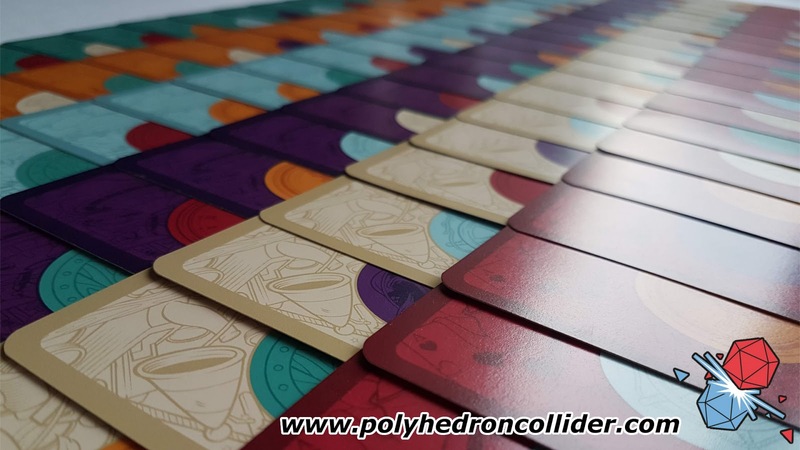 Each of the six card colours is used to depict a different classic story, where purple is War of the Worlds, the cream is Pinocchio and turquoise is Don Quixote. The good people at Spielfritte have, in fact, done a colour blind test of the game and to me at least it looks pretty good, but have a look yourself if you or someone you're likely to play with is colour blind. 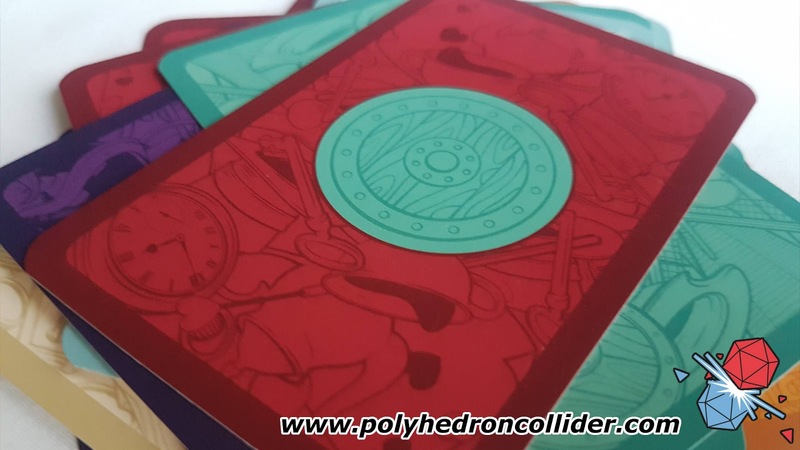 It is hard for me to know how effective the storybook identification is, I know it looks pretty and some of the colours are intentionally 'close', causing difficulty and hesitation when slapping the cards down. For me it was the turquoise/blue distinction, but I quite like it. It's all to easy to make a mistake in this game when playing at speed. And that's kind of the point. It has many of the beats you would associate with a party game, just without the larger player count and that’s not a bad thing. We’ve been able to get a game in while someone is at the bar getting a round of drinks between “bigger” games. 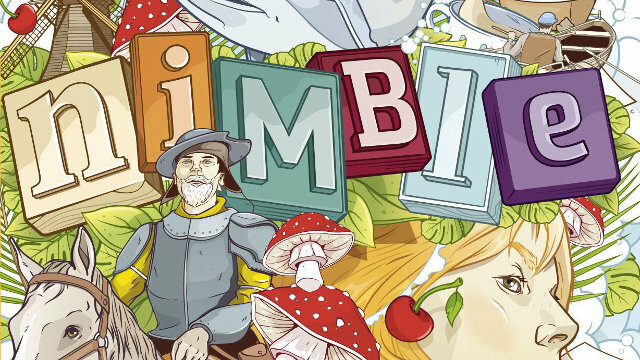 Nimble is a bridge or an aperitif in a game night, it’s a fun, family game; perfect for children. It’s light, it’s simple, and it’s a shot of cardboard childish delight that forces your attention and focus.